Musings of a Bookish Kitty: Saturday Snapshot: Caption This! 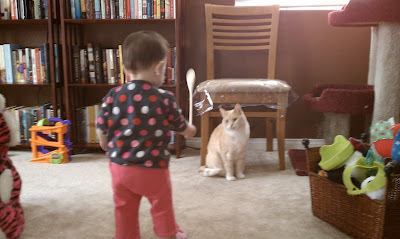 I've got the spoon, kitty, now I'm in charge! I am the director! Now get your horn out and play! It looks like she's conducting an orchestra or waving her wand. Look carefully at the wooden spoon. Your eyes are growing heavy. Kitty, kitty, what do you want for dinner?!! Cute! It'll be fun to see all the captions . . . I'm cooking tonight so it's going to be simple. Cute photo! So cute! Looks like she's scolding the kitty. "How many times have I told you..."
I want you to jump over the spoon! I have a spoon. What do you have? Cute!! Bow to the princess, kitty! I LOVE this picture...so precrious!